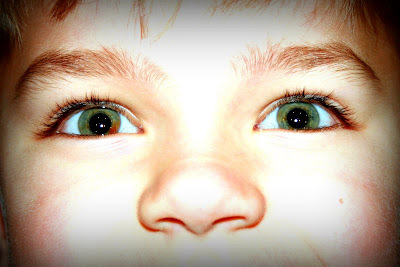 My biological kids have the strangest eyes ... beautiful, but strange. Mason has green eyes and Payton grey. They each also have brown markings throughout their eyes ... Mason's are more pronounced since his eyes are lighter (click on the photos below to see them better). I'm not really sure what it is or if it is significant, but it is there, nonetheless. Does anyone know what this is or have this? It is funny because Mason has it on one eye, and Payton on two eyes ... and the location of the brown mark in each of their eyes is the same. Payton's markings are a lot more pronounced in pictures, but Mason's you can see clear as day just looking at him. Payton also has what are called brushfield spots ... it is common in kids with Down syndrome. Hers are not as pronounced as some, but if you click on her picture above, you will see the sort of white circle that circles her eye ... those are brushfield spots. Nika has brushfield spots too ... I love her eyes! Payton's looks like brushfield spots. So pretty! I'm not sure what the brown spots are, but I had to tell you that all 3 have beautiful eyes! 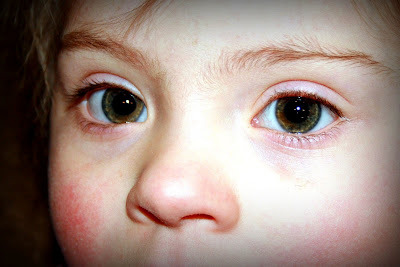 My oldest daughter has light green eyes with a brown spot in it just like Mason's. My eyes are a lot like Mason's... green with the brown spots in them. Not sure what they are but they're pretty! All 3 of your kids have amazing eyes! I have got to get your camera! Mine is just a plain little nothing, I have got to upgrade, maybe for Mothers Day!!! I wonder what an iridologist (sp?) would say. . . markings in certain parts of the eye reveal something about the body - but I'm not sure. If you look up an "iridology chart`` on-line, it might be interesting. My mom has rich green eyes and she has a brown spot on one. We always wondered about it and I always thought it was cool. I'm not sure what that brown spot could be; but all three have really beautiful eyes. That picture of Nika's eyes is really breathtaking! Such pretty, pretty eyes on all of them! It's official, I must join your family! I have the same brown spots in my eyes. I always thought of them as freckles...LOL. Love their eyes! Whoa. Beautiful. Mason also has very cool eyebrows. Great close-up of Nika! "In humans three genes involved in eye color are known. 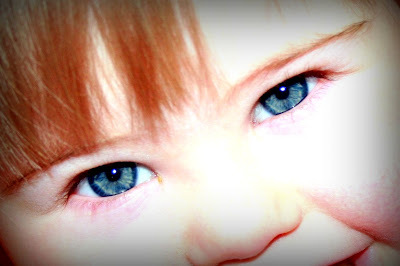 They explain typical patterns of inheritance of brown, green, and blue eye colors. However, they don't explain everything. Grey eye color, Hazel eye color, and multiple shades of blue, brown, green, and grey are not explained. The molecular basis of these genes is not known." p.s. They all have such gorgeous eyes. The brown spot can be a form of heterochromia which essentially means different colored eyes. The form I would probably think most is sectoral heterochromia. No I am not a complete nerd, I only know this because I have complete/central heterochromia myself :-P.
Oh and Nika's eyes are amazing, love it! Found your blog the other day...not sure how, but I'm going to keep following. Your kids all have gorgeous eyes. We are a family who all have plain, boring, poop-brown eyes! LOL. Except my daughter Kaia (she's 4 and has DS), she has hazel-ish eyes that I think are turning more brown as she gets older. And she didn't get the brushfield spots and I'm really bummed about that! It seems to be mostly a blue-eyed thing from what I've seen. i dont know if someone has mentioned it yet but your son has Sectoral heterochromia it is almost never a problem but it is usually caused by an excess of melanin indicates hyperplasia of the iris tissues, whereas a lack of melanin indicates hypoplasia... i dont know what he has their but for the most part people never have to worry about any thing, not people have mixed colors in the iris like i have Central Heterochromia with a mixture of violet in the center, and blue and green in the outer, and its extremely common to have what i have, whether it be minor or major... but beautiful children!!! my eyes are the same as your son mason's my eyes are greenish blue and have the exact same brown patch on the same eye and the same position..
hey there .. just wanna say that these brown spots r most likely to be iris nevi.. u no .. like the moles u have on the skin..